Jacobean London can feel like a foreign place — so alien from the city we know today that it's hard to picture it in the mind's eye. Yet through the plays from the time, we can glimpse back into that era — the sights, sounds and smells swirling around in our imagination. 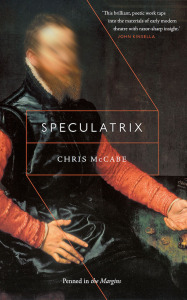 It's this period which has inspired poet Chris McCabe's latest book, Speculatrix. Each poem is spoken through the voice of a spurned or aspiring lover from a Jacobean play, each of which is set at the point of the play's first London performance, at the location of that playhouse. 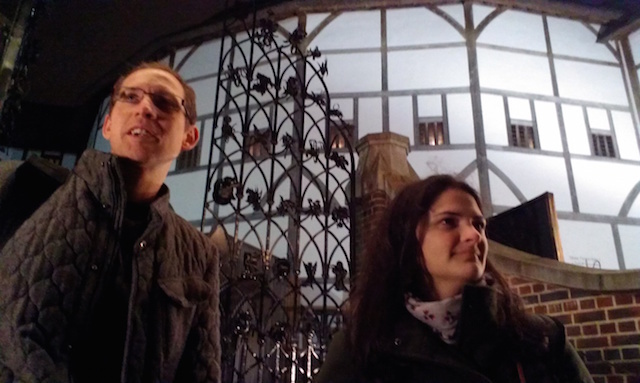 To mark its publication on 1 December, Londonist took Chris on a stroll with lecturer in early modern theatre at University of Kent — and contributor to Shakespeare in London — Dr Sarah Dustagheer. Chris McCabe: We are here on the steps of St Paul's Cathedral about to head off and explore Jacobean London. 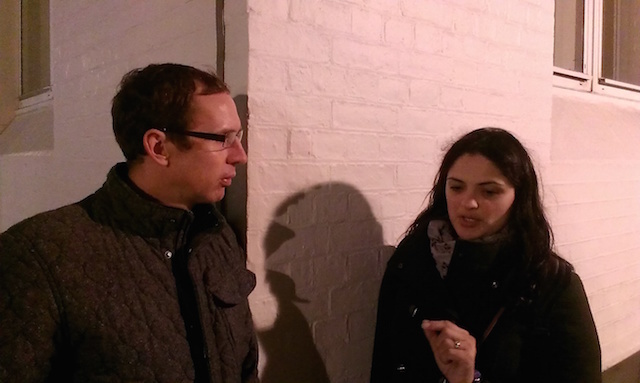 Sarah, where are the nearest remains of a Jacobean theatre to St Paul's? Sarah Dustagheer: It depends what you mean by 'remains'. Very little archaeological evidence survives. Our nearest remains would be Elizabethan, the amphitheatres of The Rose in Southwark, and in Shoreditch, The Curtain and The Theatre. In the Jacobean era several of the theatres being built were indoor, which means they often don't survive because they were built on first floors or within buildings that were subsequently destroyed. The plays are what survive. The language is what survives. Chris McCabe: And then only partially. Sarah Dustagheer: Yes. One of the things you're doing in Speculatrix is thinking about your poetic voice through these Jacobean plays. Chris McCabe: It's an extension of what the Jacobean playwrights were doing — collaboration. For me it was a fantastic opportunity to live inside those plays for a period of time. The plays I chose were quite by chance. I went to a bookshop and cleared out all the Jacobean drama on the shelves. I ended up top heavy in John Webster. There was only one Ben Jonson. I didn't use any Dekker or Ford. It was like walking around a city you don't have a map for. Some of the plays I knew, some I didn't. The language was so alive. I felt that my voice was riffing of their voices, that's what gives the sequence its energy. Sarah Dustagheer: We know that Jacobean playwrights were going to classical writers and riffing off them. Someone like Ben Jonson saw himself in a classical tradition. Like you, they were collaborating with the dead. Sarah Dustagheer: We are walking down Ludgate Hill and have come to what was once the Fleet River. It's an interesting place to stop and think. This is a crossroad between west and east. The east spreading out towards the City and the financial heart, the west spreading out to socially elite Jacobean London. What's interesting about Speculatrix, Chris, is how you are interested in financial power but also social status. Chris McCabe: It strikes a personal chord for me, because struggles with money have always been an issue in one way or another. We're standing here staring at two Santander cash machines, which seem to promise us everything, beautifully lit up, bright red. That's the connection with the Jacobean period for me. Finding this surface level angst about money. It's never a settled issue. If those who have it want more of it, those who haven't got it want it. There seemed to be no middle class at all. People could rise, they could have it all, but there's no contentment, no nice house in the suburbs. It's this urgency throughout Jacobean drama that I connected with. The stakes are high. Sarah Dustagheer: In this period you're getting the emergence of what we think of as middle class but it's all in flux. One of the plays you write about is The Knight of the Burning Pestle. The two characters in this play, George and Nell, the citizen and his wife, are clearly well off because they make a big show of going to the Blackfriars playhouse. But they lack class. What's happening in this period is a clash between those with financial clout and those with status. Where new money meets old money. Chris McCabe: It seems like the beginnings of a familiar culture where people can fall into debt without seeing any money, just related to what they owe to someone signed on a piece of paper. My own experience with payday loans, I found myself with money coming into my account, and a cheque going out to someone else. And this is money I'm never seeing. Your life is being formed by an invisible contract. Sarah Dustagheer: They were seeing the beginnings of the capitalist system of credit and debt. So instead of trading in gold, silver, tangible materials, it's being replaced with intangible ideas. You can't touch the money, you can't see the money. It's being taken out of the hands of ordinary people. It becomes global, it becomes commercial. In 2008 we saw the repercussions of a system that began in the Jacobean period. Chris McCabe: The idea of a bank run, when everyone comes for the money at once. In the Jacobean period that would have been everyone running for the signed bits of paper, the tally sticks and IOUs. The beginnings of the zeros and ones we know are flying around us all the time. Sarah Dustagheer: The Alchemist [by Ben Jonson] is a comic play about alchemy, the idea of taking base metals and turning them into gold. Jonson is making fun of that, but people believed it. How far is alchemy a metaphor for other things happening in society? People changing identity, changing class, women being treated as objects, one thing becoming another almost by magic, without any work. Jonson is interested in how that isn't really true, or comes with a lot of catches. Chris McCabe: What strikes me with Jacobean plays is how the richness of the language falls within the baser characters. In The Alchemist it's the conmen who have a gift for insult. It's mind-blowing, you can almost smell the city in the description of passageways and the backs of houses, which you would not expect to surface, but in the Jacobean it's what people want to hear, it's where the laughter is. Anyone who is renting in London should read The Alchemist. It's about that dynamic of renting space from someone else who owns the house. And everything happens when the landlord goes away. The subconscious is being unleashed. The ego has left and the mind can do what it likes. I think we've all experienced that. The landlady has gone away and it's time for the party to start. Sarah Dustagheer: London is becoming increasingly claustrophobic. It's almost like it's the houses people become trapped in, imprisoned in — even stuffed in cupboards, as happens in The Alchemist. Standing here at the junction of Ludgate Hill and Fleet Street, you can hear the traffic behind me, and the city is still a claustrophobic place. You can easily get swept away. Sometimes that's a good thing, sometimes it's dangerous. Jonson is interested in the sweeping away. What happens to people who don't know London, who come to this city as ingénues. Chris McCabe: And 40 years later the city itself gets swept away by the Great Fire. The city can't become contained along those old lines any more. 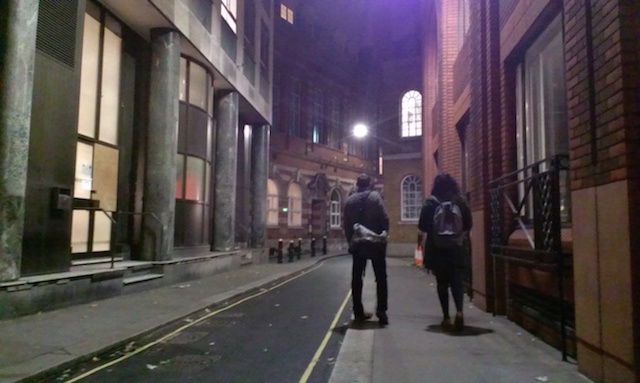 The pair move on to Bride Lane in the precinct of Bridewell. Bridewell was a palace belonging to Henry VIII, then in the Jacobean period it became a prison and was a place where crimes of sexual demeanour were punished. It was cheek-by-jowl with the Blackfriars precinct, where many plays were performed, some of which had women and men doing sexually deviant things, so these are plays interested in sexuality being performed right next door to a correctional institution. Chris McCabe: It's interesting how the correctional and the libidinous existed side by side. I wonder how that relates to today's London and particularly the riots. What you've got there is a moment of calm that explodes. A police incident in which someone is killed, and then the whole city erupts. Sarah Dustagheer: There was a real anxiety about rioting in early modern London. Those in authority were fearful of large crowds of young, working class men, especially in playhouses where as many as 2,000-3,000 people gathered. Standing in the yard of the early modern playhouse you could have 500 or maybe more young men and women, prostitutes as well, hearing potentially radical ideas. You can see why the court and the city saw playhouses as powder kegs for rioting and bad behaviour. Chris McCabe: Quite a few Jacobean playwrights were arrested. A Game of Chess got Middleton in a lot of trouble and he seems not to have written another play after that. What kind of tricks and tropes did writers pull out to get away with having a dig at the establishment? Sarah Dustagheer: Playwrights and companies of actors, such as Shakespeare and his King's Men, needed and sought the patronage of those in authority. They walked a fine line. One of the ways playwrights did this was by setting their plays elsewhere. Middleton often set his plays in Italian courts, which were a veil for talking about James I's court. Shakespeare used historical and foreign settings to think deeply about his own society. The book I've co-written, Shakespeare in London, takes on that idea that Shakespeare doesn't write about London and argues that when you peel back the surface what you find is the sights and smells and ideas of London permeating the plays. Chris McCabe: Anyone writing now can say whatever they like. There is no pressure to censor or curb an opinion but what's often damaging to a poem or novel or play is the over-egging of a point, letting a political stance weigh down on the nuances of language. I'm careful not to let my politics or viewpoint weigh down on the poem, which is hard to do when you're in the middle of a poem because it is both conscious and subconscious and it's being censored in a microsecond as you're writing. Sarah Dustagheer: I wonder if you would have been as inspired by the plays if they were more direct, proscriptive representations of London. The reason you've been able to edge your way in, pull them apart and put them back in your own image is because of the gaps. That's one of the ways censorship can be productive. Creativity comes from boundaries. Chris McCabe: There's a huge wave of metaphysical poetry being written in this period, often formulaic, taking forms like the sonnet and making them into a new version. It's never appealed to me as Jacobean drama does. The true poetry is in the plays of the time. What you get in John Donne for example is the beginning of the workshop poem, the poem almost like a snow globe. It's perfectly contained, with a picture or conceit, and you turn it around and arrive where the poet wants you to arrive. Donne's an incredible poet and he's the best at turning that trick. But for me it's what goes on between the lines that really excites me. So the poetry doesn't have to come at the end and it all makes sense. What you get with the Jacobean playwrights is a punk dynamic, a real messiness, an edge. Everything seems to be at stake. Living in a city where average life expectancy was around 40, it brings that urgency we all feel about our lives to the top level. It was also a city where people drank 40 gallons of beer a year, including children. Sarah Dustagheer: We're now standing by the water by the reconstructed Globe. The bridge is a modern, steel structure lit with blue lights, and certainly not the way Jacobean Londoners would have crossed the water. They would have taken the boat or used London Bridge. It's got me thinking about the use of anachronism in Chris's poems. These are poems about Jacobean London but they are full of references to contemporary London. I'm interested, Chris, in what that does for you. What does it mean to bring together in clashing and colliding ways Jacobean London and the city we now know? Chris McCabe: It's an experiment. I would carry a play around with me, absorbing that language, soaking it up, allowing it to clash with whatever I was encountering in the city. So there are many moments in the poems when I will jump straight through Jacobean language to a description of a conversation or an encounter in work, or a situation on the tube that asks to be written in to the weave of the poem. So you create a frame and allow it to be occupied, to be taken along wherever it takes you. Speculatrix is published by Penned In The Margins on 1 December. It can be pre-ordered here.